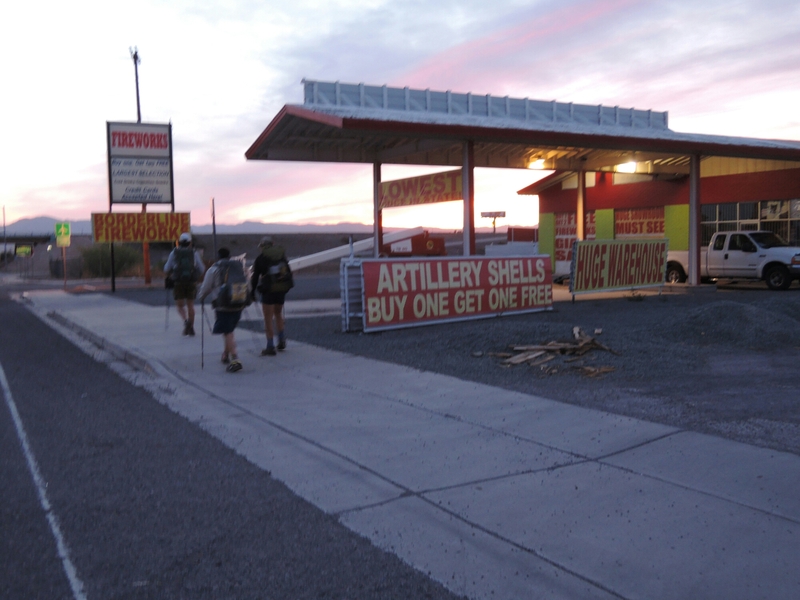 I joined our group at 6:30 am on April 23 and walked out of the EconoLodge in Lordsburg. The air was calm and chilly, and I recalled the wicked thunderstorm the previous evening that would have wreaked havoc had we been camping in wind that blew that evening. 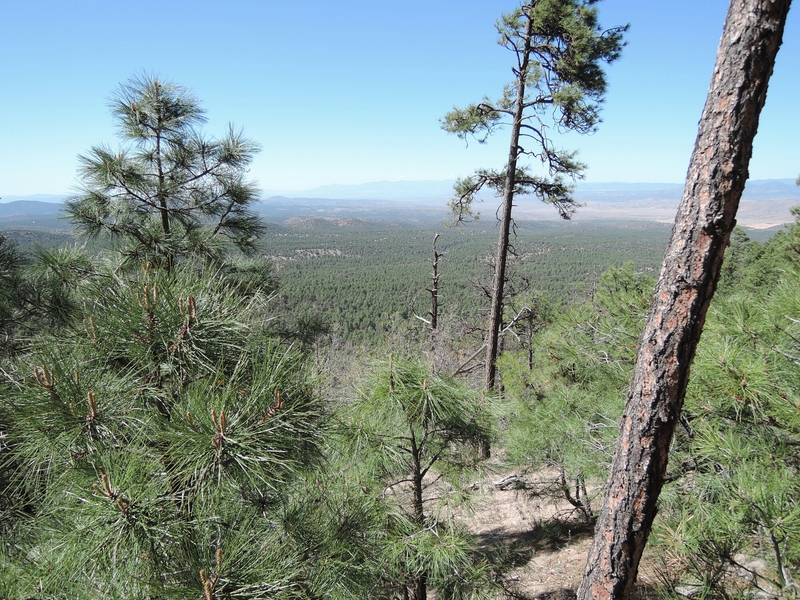 After a 6-mile roadwalk the route heading towards Silver City crossed a broad desert plain that gently sloped toward the mountains we would enter late in the morning. 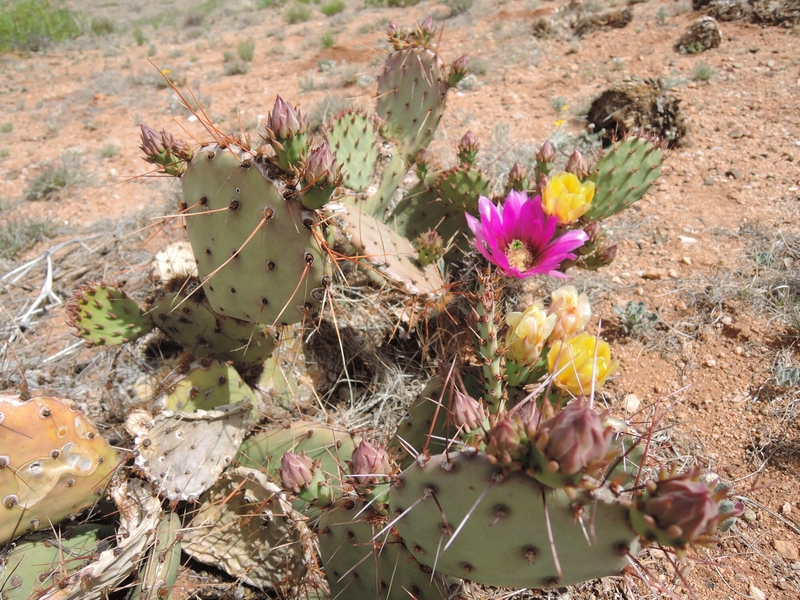 The desert floor was adorned with prickly pear and numerous bushes which the grazing cows chewed without end. Allgood, Big John, Mosely, and Buttercup took some hilarious photos of themselves wearing cow bones and a skull in amusing ways. I was happy to feel the cooler temperatures in the mountains. 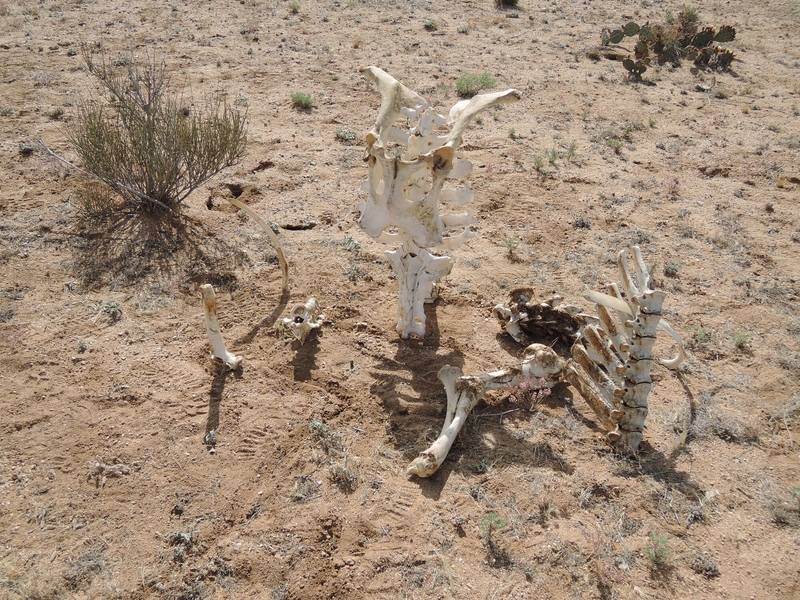 The camp on the first night out of Lordsburg, April 23, was at 6650’, the highest so far. My tent was surrounded with sheltering trees which blocked the wind nicely. During the day I thought of my friend, David DiCesare, who passed away in January. His memorial event was held in Vancouver earlier that day, and he was with me in spirit as I told Big John about David. 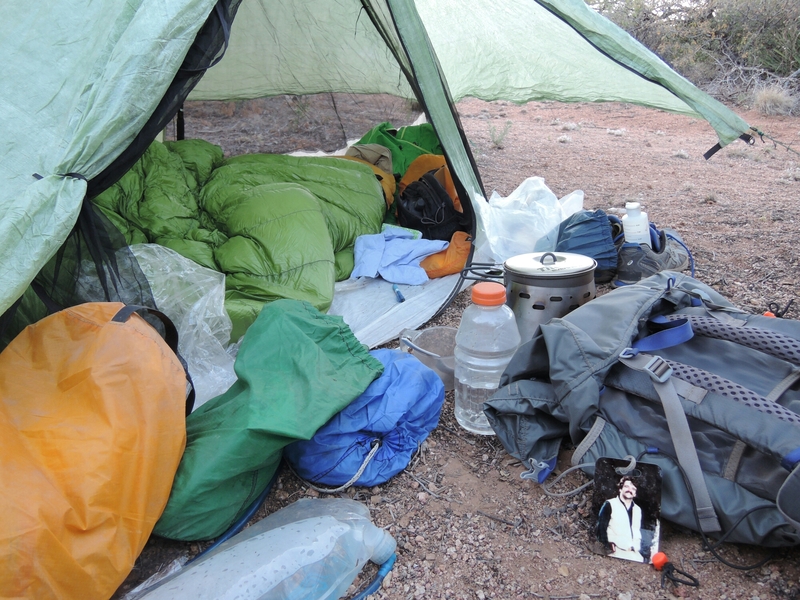 A special tag with David’s photo, taken on my first backpacking trip with David & Lynn, hangs on my pack. From Burro Peak the hike to Silver City was essentially all downhill , including a 20 mile roadwalk on a Forest Service road and Highway 90. Allgood and I started walking together on the road at 4:30 am after camping among trees and under a clear sky. The easy, cool and very early walk along the roads gave me peaceful time to reflect on the first 8 days and 143 miles of my CDT journey. 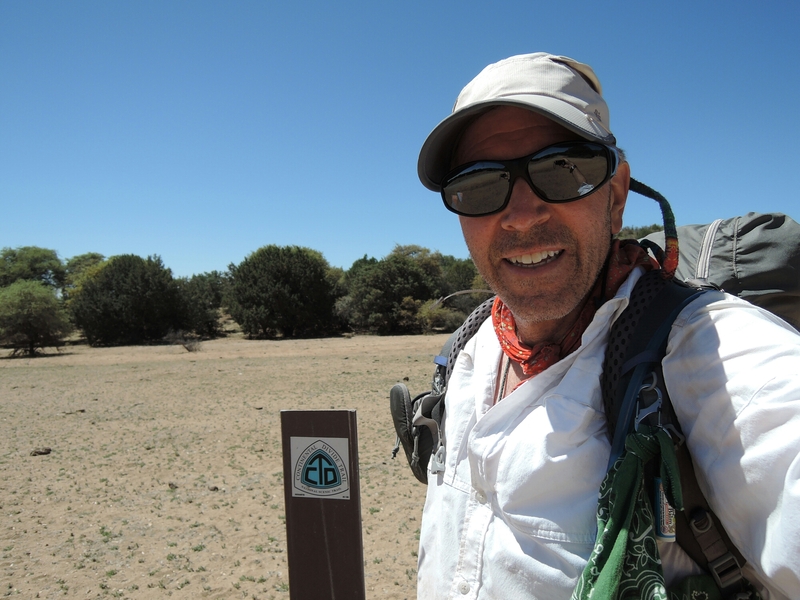 This is a time of adjusting to life on the trail, mentally and physically. Because I am on my first long distance thru-hike in 20 years, the adjusting feels new again. But I know what to expect. The leg cramps are gone for now, and the muscles are stronger. Hydration challenges were solved by drinking more water and taking salt supplements given to me by generous hiking partners. After more weeks of hiking, there will be less pain and more flow. I think of ways to improve: some small items in my pack were not necessary and are mailed ahead. Other items were repacked so they are easier to manage when needed. This first phase of transformation is just the beginning of a 2,800-mile journey which is more about the daily zen practice of walking an average of 20 miles per day rather than anticipating the distant, intended destination far to the north. I embrace the challenges and enjoy the expansive views that took sweat and muscle to reach the viewpoints! Silver City, New Mexico is a really nice town! While entering the historical town center Big John and I passed the Carter House, owned by Wendy and David. They frequently allow CDT hikers to stay in the lower floor which is converted into a hostel. Wendy hiked the PCT in the early 80’s, and her kindness has made the zero day in Silver City a restful experience. Cool Roger! It’s still snowing here in Colorado. We got six inches last night at 9,000 feet. 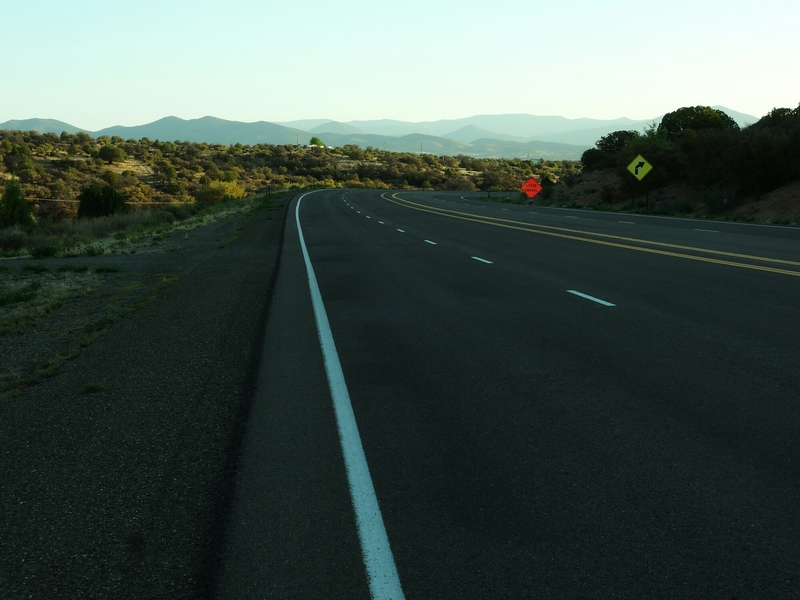 I love the Gila as well as the wonderful people of New Mexico! Be well. Great progress on the hike! I see Allgood, Big John, Mosely, and Buttercup are keeping you entertained! I have a feeling Allgood was behind the bone humor. I hope you can remain healthy throughout the hike. Good luck on your CDT this year. I will follow along on your blog. David’s memorial was good for the soul. Knew you were there in spirit. Thanks for letting us share your journey. I am enjoying your writing and the willingness to share what you are thinking! I remember getting my trail legs and a mindset that the trail was my home around Big Bear on the PCT. Wishing you a wonderful adventure Roger! You look so normal (if you know what I mean). So you are looking GREAT!